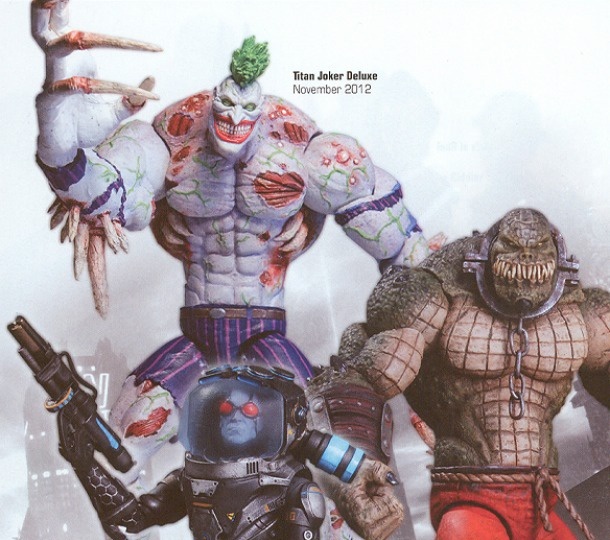 Several characters from Batman: Arkham City are heading to a comic store near you. It's been a busy week for toy aficionados. Along with Mass Effect and Gears of War, it look like Batman: Arkham City is also going to have its own toy line. Comic book retailers recently received a product catalog from DC Direct (the collectibles division of DC COmics), and introduced details on several action figures based off of Rocksteady's Batman games. Scheduled to arrive later this year, the new line of figures includes The Penguin, Ra's Al Ghul, Azrael, one of Joker's clown thugs and the Dark Knight himself. Special deluxe editions of Killer Croc and Mr. Freeze will be available in June, while a Titan-mutated Joker will be grinning his way into stores in November. There's currently no info yet on the retail price of any of the figures, although so far there appears to be a lack of other notable Batman characters. Two-Face and Catwoman are sadly missing from the line up, along with Harley Quinn and Dr. Hugo Strange but with any luck DC Direct may bring more of Arkham City's rogue's gallery to life in the future.